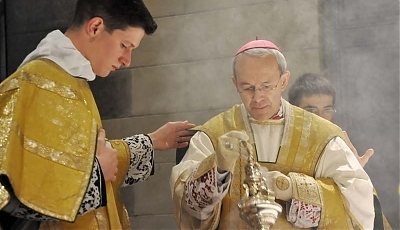 Bishop Schneider: "I have asked Msgr. Fellay not to delay his acceptance any longer"
Our partners at Adelante La Fe (Rorate in Spanish) today published an exclusive interview with His Excellency Bishop Athanasius Schneider. The answers he gives are very blunt and bold -- even for the great bishop. It's pretty clear even by just skimming his answers that he believes the time has come for the Society of St. Pius X (SSPX). The traditional liturgy is the liturgy of Vatican II, perhaps with small changes.